Not surprisingly, it’s one of our highest ranking search terms. Apparently, tons of people want to know if farmers are rich. And I think the answer is, no. They are rich in all the things that matter, but are pretty middle class. They just deal with a lot of money coming in AND a lot of money going out. And all that money coming in looks like a lot if you don’t know the whole story. So here it is … the whole story. I hope you take the time to read through what sounds confusing and get to the summary at the bottom because it’s worth it! Promise. In order to grow a crop, farmers must buy things like seeds, equipment, chemicals and fertilizer (surely one of you has a bag of Miracle Gro around for the garden, right?). And there are also the costs that you don’t really think of like land, and maybe someone to help you get the crops planted or harvested in the span of a few weeks. According to the University of Illinois, those costs – input costs – average to about $600 per acre for corn in Illinois. And, I should clarify: the $600 includes equipment, labor, seeds, fertilizer, and chemicals. No land. And land is expensive. Using last year (2013) as an example, farmers made an average of $900 per acre on their crops. If we subtract the input cost average, we can assume that a farmer made about $300 per acre last year. But did you know that most farmers are renting the land that they farm? Cash rents for land in Illinois are widely variable, depending on the soil type and productivity of the land. A farmer might pay $60 per acre to farm it or $400 an acre. But since we’re working in averages here, we’ll say that farmers pay $250 per acre to cash rent their land. Subtract that from the $300 per acre and this average Illinois farmer is making about $50 an acre on the farm last year. SO HOW MUCH DID THIS FARMER BANK? If he’s farming 1,500 acres, he made $75,000. If he’s farming 1,000 acres, he made $50,000. If he’s farming 500 acres, he made $25,000. But here’s the kicker: 2013 was a GREAT year for farmers. WHAT’S A BAD YEAR LOOK LIKE? What does all this price structure look like in a marginal year? Well, let’s make some predictions for 2014 because although we will set a big record on overall bushels produced, prices have plummeted so farmers really won’t make any money. If this farmer farms 1,500 acres, he will lose $37,500. If this farmer farms 1,000 acres, he will lose $25,000. If this farmer farms 500 acres, he will lose $12,500. Are farmers rich? I guess it depends on your definition. Farmers work for themselves. They avoid florescent lights and opt for sunlight. They understand the feeling of hard work and a job well done. Connection with the earth and all of God’s creation is a daily part of their lives. But farmers are not wealthy. In good years, farmers can make decent money. And some short sighted people look at one good year and think that farmers are making a killing and have become big business. In bad years, farmers lose big money too. The trick is, good budgeting and saving. And, of course, a healthy dose of faith. Because the good years get you through the bad years and at the end of the day, you’ve committed yourself to a life with your family, in touch with the earth, doing the very thing that you love. And there’s a lot of value in that. Author corncorpsPosted on September 30, 2014 November 14, 2018 Categories Who are Illinois Corn Farmers?183 Comments on ARE FARMERS RICH? First and foremost, is the smell of harvest. The smell I associate with harvest is the smell of dried grains. It is a sweet and powdery smell which brings satisfaction to any farmer. This is the time of year that farmers can finally collect their crop that they’ve worked hard all year to prepare. I also think of diesel exhaust with harvest. Although this may not sound like an appealing smell, for someone who has grown up with it, it is one of those odd smells that simply reminds you of home on the farm. During harvest, many machines break out of the barn for the first time in the year. One of these is the combine. The combine is a large machine that cuts the stalk of whatever crop it is harvesting and brings it in to separate the grain from the plant. The grain is then collected on top of the combine which is transferred to the hopper when it is full, as shown above. One of my favorite memories of farm life is riding in the little makeshift seat of a combine with a loved one on a full day of harvest. I think every farm family knows the smell of a good hearty meal. The smell that hits you when you walk into a candle store is similar to the smell of a farm house kitchen. A mix of fruits, spices, meats, homemade bread, and stews are staples in the kitchen during fall. Many families take roles in harvest. Some are responsible for delivering these delicious warm meals to the other family members while they are out harvesting. One of my favorite meals that screams farm life is burgoo. 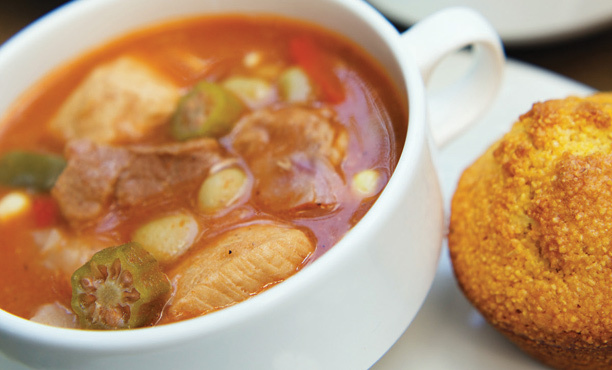 Burgoo is a very hearty stew with beef, potatoes, and many other vegetables. We even have a festival for it here in Illinois! Small town rural America is littered with fall festivals during the months of September, October, and November. These festivals bring smells of pumpkins, apples, homemade pies, and candies. Small towns are so beautiful in fall and nothing beats the sight of a fall festival in an old barn. One of my personal favorite fall festivals is the Spoon River Valley Scenic Drive in Fulton County, Illinois. This takes place every year in the first two weeks of October. Roadside stands of pumpkins, gourds, and Indian corn pop up everywhere. Crafts and antiques are put up for sale and these small towns welcome visitors. There is no way to put in words the smell of soil. A healthy soil has a very distinct smell due to the microorganisms that help bring nutrients to the crop and maintain a good soil structure. All of these are components farmers have to take in consideration when choosing farm ground. Good fertile farm ground is a prized possession in rural towns. Small towns are known for their “nosiness” in everyone’s business. But one subject that is always discussed at the local donut shop is the different types of soil other farmers own in their community. 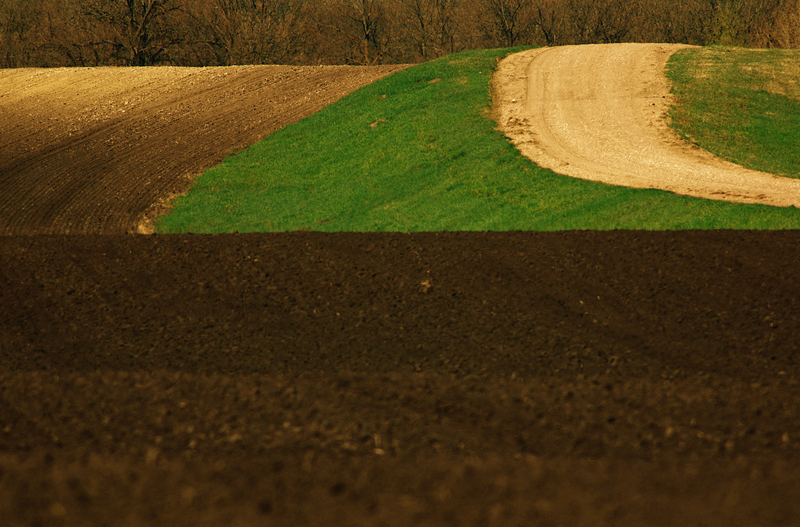 A farmer can spend hours discussing the way their soil responds to tillage, flooding, and erosion. In fall, many farmers till the ground for preparation of next year’s crop after harvest. The smell of a field of dark, rich, healthy soil is a gift that farm kids learn to appreciate early on. I hope you enjoyed experiencing my farm life through the smells of fall and get a chance to appreciate some of these rural ways of living. I know I couldn’t picture my life any other way. I’m passionate about the farm, but I work in the IL Corn office. And I have to tell you, all these #ILHarvest14 photos are going to be the death of me. Looking at them, I can just smell the harvest in the air! 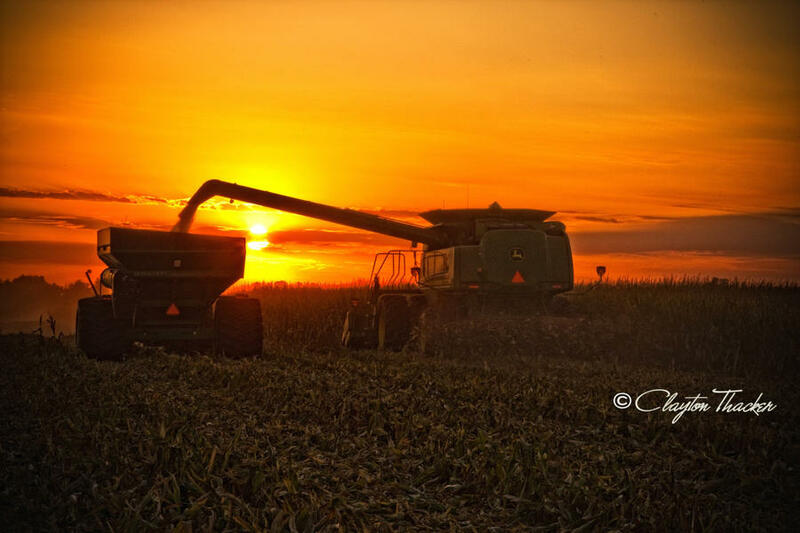 If you’d like to check them out, head on over to our Facebook page and virtually experience the IL Corn harvest for yourself! This September is going to be pretty busy month on the Taylor farm in Central Illinois. The late summer/early fall time frame always has us hopping, trying to get ready for harvest, and I wanted to share some of the goings on around our place this month. Enjoy! The biggest event happening on our farm this September is the assembly of a grain bin. Panel by panel, bolt by bolt, this life-size erector set is coming together under the direction of my husband, Bart. Many friends have lent a hand and a crane has been brought on scene to aid in the awesome undertaking. Picture, if you will, the top portion of the bin being lifted off the ground by the crane as nine guys scramble to attach the legs. Three hours or so later, the crane is able to boom down as the legs are attached and ready to be tied-off so a passing storm doesn’t blow over the work in progress. Many x-braces and over 2,000 tightened bolts later, it will soon be permanently attached to its concrete base and ready for years of use. Not everything on the farm is brand new; in fact, with the exception of the grain bin and the auger attaching the bin to the grain dryer, all of our other equipment is used (some pieces MUCH more than others). And, with so many moving parts on this used equipment, one might think that the squeaky wheel gets the grease. However, many hours this September will be spent trying to prevent the squeak in the first place. Wheels will be greased, tires will be aired, belts will be tightened, oil will be changed, filters will be replaced, and the list goes on. These actions are less costly and oh so much less stressful than an untimely breakdown. And in order for our operation to run like a well-oiled machine, this planned maintenance is essential. Talking about maintenance, how could I forget to mention sharpening blades? Because of rainfall, the roadsides are going to need to be mowed again this September. Unlike yards that have been mowed weekly or even more often this summer, our roadsides will have been mowed only three times in total. Less about appearance and more about safety, the mowed strips will provide visibly-safe spots for farm equipment to ease over onto when meeting autos and semi drivers will be better able to gauge where to pull alongside to get loaded. Whether mowing, combining or transporting, it takes fuel. So, another preparedness act in September involves filling the on-farm fuel tanks. The equipment runs on diesel, and lots of it! The combine, for example, holds over 200 gallons at a time, and during full blown harvest, it will need to be filled every day and a half. So, yep, you guessed it… we see a lot of our fuel man throughout harvest, and it all begins with that initial fall fill. A few of our neighbors have been able to start harvesting their crops this month. However, it will probably be October before we begin. And since I cannot yet pick corn, I promote it. Several times throughout the Broom Corn Parade in Arcola on September 6th, the onlookers burst into applause as the ethanol promoting, E-85 truck rolled by. It could have been because of the cute farmer driving it…LOL… or the fact that I was throwing candy. However, I have to believe folks are simply tired of the expense at the pump and they are excited about a cheaper, locally grown fuel. Well, since not every day can be a parade, it’s back to work for me… September is a busy month on the farm! It’s Flashback Friday (or a belated Throwback Thursday, you pick). Do you know anyone in this photo? Call them out in the comments! Yesterday, the U.S. Department of Agriculture (USDA) issued its decision deregulating (or approving) the Enlist corn, Enlist soybeans, and Enlist E3 soybean traits in the United States. The announcement concludes one of the most thorough reviews of a biotech trait in history. Sadly, the EPA still has not registered Enlist Duo herbicide, the companion to the Enlist traits. Dow AgroSciences hopes for registration in the near future. Illinois Corn Growers Association submitted comments to the USDA supporting the deregulation of the Enlist products and is happy that farmers will have more options for weed control in the future. However, we remain concerned about the time USDA and EPA are taking to review these products and other traits and chemicals that farmers want to use. Yes, due diligence insures that the products are safe, both for humans and the environment. But how much research is too much? Where is the line when we accept what we have, make a decision, and move on? IL Corn’s comments on both these products have always focused around using sound science to determine approval and registration. If science indicates that no harm will come to humans or environment from the use of these products, there is no reason to hold them ransom in the approval process. And, simply because of its longevity and history of use, 2-4D (the chemical in Enlist Duo) is one of the most studied chemicals in history. Now it is partnered with the most reviewed biotech trait in history. Americans should feel good about the safety of these two, though I’m sure many activists will raise concerns. And in the meantime, while we fight about scientific evidence in America, these products are being approved in other countries much more expediently, leaving American farmers at a competitive disadvantage. Thank you, USDA, for making the Enlist crops available to Illinois farmers this week. Thank you for paying attention to scientific evaluation when making a decision, and not catering to public, and very emotional options. Thank you for any pressure you can put on the EPA to do the same for their registration of Enlist Duo. But the entire industry would be must better served if all our governmental agencies – USDA and EPA included – would simply look at the scientific evidence, make a reasonable decision, and move on without dragging their feet while trying not to upset an emotional public. For those of you who grew up on a farm you will know exactly what I am talking about. Growing up in a farm family, like anything else, has its pros and cons but it definitely a unique experience to say the least! Hopefully, this will give the “non-farmers” a little bit of insight to what it is really like. Farm kids know this one all too well. Planning family activities, attendance at Saturday tournaments, or RSVPing to a wedding invitation is next to impossible during planting and harvest seasons. If the sun is out and the sky is clear (enough) that combine or planter is moving then plans are out the window! Dinner is never eaten at the same time or place. Just like the equipment, when a farmer is in the field he needs fuel to keep on keepin’ on. Some of my favorite childhood memories are taking Grandpa and the crew supper and eating it in the tractor or on a tailgate. For some unexplained reason, it seems every farm family grew up with the “farmer 5” TV channels. I guess what more explanation do you need than… it’s free! And besides, who needs to watch TV when there are animals to be fed and work to be done! I hope most of you have the song “Drive” by Alan Jackson? If not look it up, I promise it is worth it. Driving for the first time at a young age (under parents supervision of course) is typically very common in rural America. As a farm kid, you can drive more than a car by then and do it on your own. By the time you get to your driver’s education course when you turn 15, you can drive an automatic, a stick, a tractor, a forklift, and more! Having a farm right in your backyard makes you the hot spot for all of your friends to come over and play. You know what you can and cannot touch. You also know all the fun hidden places to play in the barn. There almost always some cute baby barn cats to pet as well! When you have this much possibility for adventure, who needs cable anyways! Despite the constantly, undetermined schedule and the hefty amount of chores to be done the farm life is pretty sweet. Farm families work together to live the life they love and provide for others, while still trying to lead a “normal” life. This profession is typically handed down from generation to generation so working together with your children is very important. I have not encountered many who have said they would have wanted it any other way! CHICKEN MONTH: CELEBRATE WITH CAPRESE GRILLED CHICKEN! While September is often associated with the end of the summer, back-to-school shopping, and football, it’s also National Chicken Month in the U.S. That’s right; for more than 20 years, thanks to the National Chicken Council, there really has been a full month devoted to one of the most versatile and affordable sources of protein! Even though summer is coming to a close, it’s never too late to fire up the grill. This is one of my favorite grilled chicken recipes. It is great served with a side of pasta, garden salad and white wine! Whisk together the balsamic vinegar, water, onion, red pepper flakes, and garlic in a bowl, and pour into a gallon Ziploc bag. Add the chicken breasts, coat with the marinade, squeeze out excess air, and seal the bag. Marinate in the refrigerator 30 minutes to overnight. Heat balsamic vinegar in a small saucepan over medium heat. Bring to a boil then reduce heat and allow to simmer, stirring occasionally, until vinegar has reduced by half. Remove from heat and set aside. Brush grill grates lightly with oil and pre-heat grill to medium-high heat. Top each chicken breast with one slice of fresh mozzarella and a slice of tomato. Sprinkle chopped, fresh basil over chicken and then drizzle with balsamic reduction. Author corncorpsPosted on September 15, 2014 Categories FoodTags caprese, chicken, Grilling, national chicken month, recipeLeave a comment on CHICKEN MONTH: CELEBRATE WITH CAPRESE GRILLED CHICKEN! THE BETTER BREAKFAST … TRY THESE NOW! It’s the middle of September. School has been in session for a couple of weeks now and that energy you had to wake up early and get going … well, it’s gone. Now your mornings consist of waking up on the edge of “barely enough time” and “we’re going to be late.” The kids run around trying to pack lunches and book bags and you’re applying make-up in the car as you wait for the school bus. I define “the better breakfast” as something that is healthy, contains protein, is made ahead of time and can be portable. And these recipes all qualify. WOW! Make them ahead of time and throw them in the freezer for a healthy breakfast fast. I like to add salsa and some spicy cheese to mine! Add any fruit you want and think about freezing in a paper cup if you want portable AND disposable. I also add a little maple syrup to mine so that the kids like it more. I happen to like these with some extra cinnamon and some dried apples … I just love apples and it’s hard to make apples portable (I have to cut mine and hate just biting off the core!) without ending up eating a brown apple. Anyway, a great recipe no matter what variety you love most. These are our ultimate favorite. I leave the salsa off here though because we find that it can make the tortilla a little soggy. Play around with it! They are super easy! Spend a Sunday afternoon prepping each of these and you’ll end up with healthy breakfast options all month! Have fun! Author corncorpsPosted on September 11, 2014 Categories FoodLeave a comment on THE BETTER BREAKFAST … TRY THESE NOW!